This photograph of Gertrude Amelia Hopkins (1894-1973), Theodore Dreiser’s favorite niece, is, as far as I know, unique. It is the best photo of Gertrude that I have ever seen. I am grateful to Mrs. Gloria N. Vevante, Gertrude’s niece, for giving me this photo. Gertrude Amelia Hopkins was the daughter of Theodore Dreiser’s sister, Emma (Dreiser) Nelson (1863-1936). Emma (Dreiser) Nelson was the real life prototype of the lead character, Carrie Meeber, in Theodore Dreiser’s first novel, Sister Carrie. Attached is a gorgeous photo of Gertrude Amelia Hopkins (1894-1973), who was TD’s favorite niece. The photo was given to me by Mrs. Gloria Vevante. Mrs. Vevante was born Gloria Nelson. She was Gertrude’s niece. Her (Mrs. Vevante’s) father was George Nelson. George Kates Nelson (1892-1955) was the son of Emma and Hopkins. He took the name of his stepfather, John Nelson. George was a hotel manager in Manhattan for most of his professional life. He married a woman, Gunda Ryerson, who had emigrated when young from Norway. For many years, his family lived in Manhattan. George had nothing to do with TD and did not seem to have been intimate with his mother, Emma, as an adult. He was apparently somewhat of a wild kid who straightened out as he matured. He knew Paul Dresser and as an adolescent would spend time with him. His first name, George, is possibly significant, since Hurstwood’s first name is George and he has a son named George, Jr.
Gertrude alternatively used the names Gertrude Hopkins and Gertrude Nelson when she was young. She aspired to be singer when young. She was close to Emma. She ended up working for Con Edison in Westchester County. She married a coworker, Emil Dorn, and became Gertrude Hopkins Dorn. But, she found out — much later (I believe it was after Dorn’s death) — that Mr. Dorn was already married (when he married Gertrude) to a wife who had been found mentally incompetent and was confined to a hospital. Gertrude went back to being Gertrude Hopkins. Gertrude died in Westchester in 1973. Her letters to TD are touching. Harold J. Dies (1914-2012), a descendant of Dreiser’s aunt who was Trustee of the Dreiser Estate (he was a cousin of Dreiser’s second wife, Helen Patges Dreiser), knew Gertrude well and played a major role in administering her estate. It is clear that he was fond of her. Tedi Dreiser Goddard and her mother, Dr. Vera Dreiser, knew Gertrude but didn’t seem to give her the time of day or think that much of her. Helen knew Gertrude and liked her. And, at an early age, at least, Gertrude used to correspond with Jug. This entry was posted in Dreiser's family and relatives, photographs and tagged シオドア・ドライサー, シオドア・ドライザー, シオドー・ドライサー, シオドー・ドライザー, セオドア・ドライサー, セオドア・ドライザー, George K. Nelson, George Kates Nelson, Gertrude A. Hopkins, Gertrude Amelia Hopkins, Gertrude Dorn, Gertrude Hopkins, теодор драйзер on December 26, 2016 by Roger W. Smith. Above are two photographs which, after some thought, I believe are of Theodore Dreiser. As far as I know, they are unique and have not been published or posted before. Doesn’t look like him to me. For that age, the photo is too heavy set a person, among many other things. Check out all the photos at Penn in the Dreiser collection; nothing remotely like this. These two photos were sent me by a descendant of Dreiser’s maternal grandmother. She has a lot of precious family photos, several of which seem to be unique, including photos of Theodore Dreiser; Helen (Richardson) Dreiser and her family; and Paul Dresser. There were four photos purportedly of Theodore Dreiser which she sent me, along with the others of the Dreiser family and those of Helen Richardson’s ancestors and relatives. Of those four photos, two (not shown above) are definitely of Theodore Dreiser. Given that the two above photos come from a family collection, one wonders: if it’s not Theodore Dreiser, who could it be? 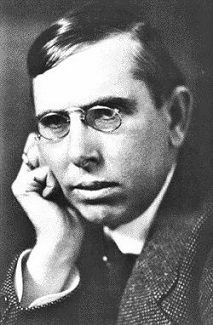 Some consideration should also be given to the fact that the owner of the photo has always understood that it was a photo of Theodore Dreiser. Addendum: Regarding the “fact” that “Dreiser” doesn’t quite look like himself here, I can’t help thinking of a passport of photo of myself that was taken when I was age 25 and was making my first trip to Europe. The photographer who took my passport photo was offputting and overbearing. He insisted that I take off my glasses. In the photo, I hardly looked like myself, perhaps because I was uncomfortable. I showed the photo to a good friend of mine. He insisted it was not me. When I was traveling, I had trouble at border crossings with customs officials who thought it was someone else’s photo. Addendum: For comparison purposes, I have posted below a collage of photos of Dreiser as a young man. This entry was posted in Gillette case and tagged シオドア・ドライサー, シオドア・ドライザー, シオドー・ドライサー, シオドー・ドライザー, セオドア・ドライサー, セオドア・ドライザー, Chester E. Gillette, Chester Ellsworth Gillette, Chester Gillette, Grace Brown, Grace M. Brown, Grace Mae Brown, теодор драйзер on December 1, 2016 by Roger W. Smith.